This exercise would make a good laboratory experiment for high school or junior college electronics courses. The required components are still readily available - Borax is in the cleaners aisle of the grocery store. 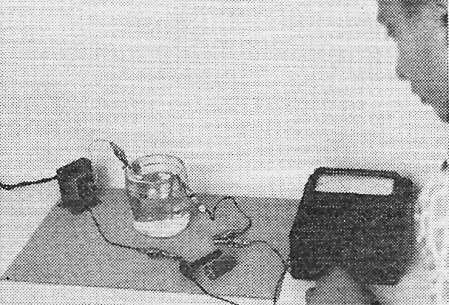 In the days before vacuum tubes, when scientists had a need to rectify alternating current power supplies they used chemical devices similar to the one described here. Ironically, this chemical rectifier is a form of semiconductor diode; albeit in a liquid state rather than in the eventual solid state. Note that the rectifier symbol in the schematic is actually the chemical device created in the first step - not a vacuum tube as it might appear to be. 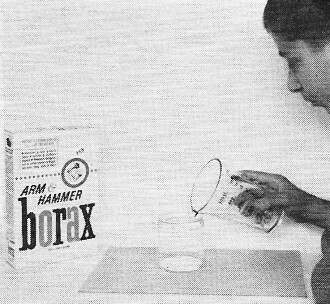 The first step in making a chemical rectifier is to dissolve Borax in water - peanut butter jar is used. Electrodes are made from a piece of tin can and a length of aluminum wire (above). Photo below shows completed circuit of Fig. 2 (next page). Connect the transformer to the a.c. line. Lamp I1 will light brightly momentarily, then gradually get dim as bubbles emerge vigorously around the aluminum wire electrode. This indicates that the semiconductor film is forming and raising the internal resistance of the rectifier. Allow the circuit to operate for about 15 minutes, then disconnect the transformer from the a.c. line, taking care not to disturb the positions of the rectifier electrodes. 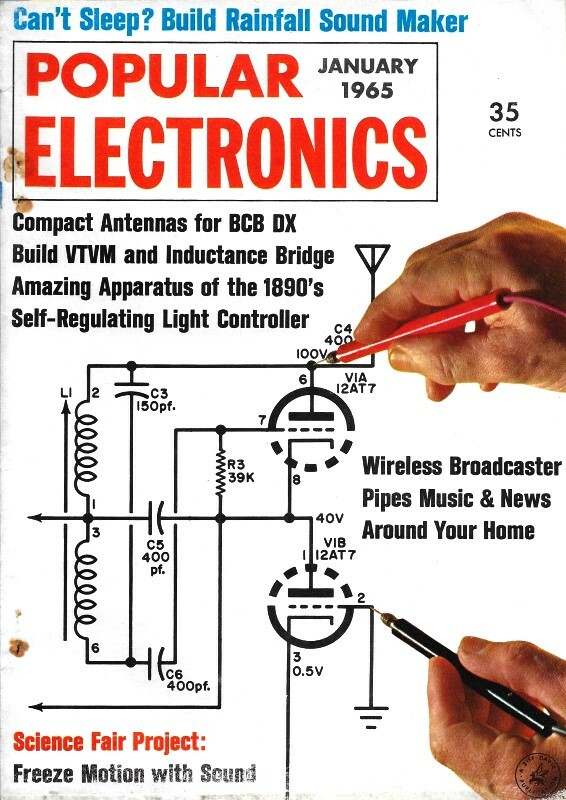 It's easy nowadays to build d.c. power supplies that operate from the a.c. lines, but in the old days before the vacuum tube and semiconductor rectifier, things were a lot different. The chemical rectifier was the only device in common use that would supply enough power to charge storage batteries. It was also used as the rectifying element in B-plus supplies. A chemical rectifier uses two metal electrodes in an electrolytic solution. When a.c. current is applied, a semiconductor film is formed, by chemical action, on one of the electrodes; the device then operates as a diode rectifier. If you'd like to observe the action of a chemical rectifier for yourself, there's an extraordinarily easy way to do so: build a working model. The author used a low-voltage chime transformer to minimize the shock hazard in the unit shown here; the rest of the components are common household items. Building a Rectifier. In a clean glass jar about 3" in diameter and 3 1/2" high (the author used a peanut butter jar), dissolve 1/2 ounce of household Borax in 8 ounces of water. Stir the solution until it is thoroughly dissolved. 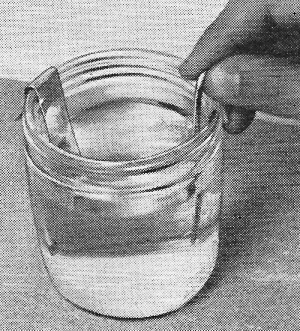 Cut a 1/2" x 4" strip from a clean tin can and position it in the solution by bending about 1" of it over the edge of the jar. In the same way, hang a 4" length of #8 aluminum wire over the opposite side of the jar. Measure the resistance between the two electrodes with a VOM, then reverse the meter leads and measure again. The author measured 40,000 ohms in one direction and 50,000 ohms in the other. The difference in resistance is due to the forming of a slight semiconductor film on the aluminum electrode caused by the action of the internal battery in the VOM. For best efficiency, a semiconductor film must be formed by a relatively large electrical current over a relatively long period of time. This can be accomplished by connecting the chime transformer (T1) and a #57 pilot lamp in the circuit of Fig. 1. Checking Performance. Measure the resistance across the electrodes again, taking readings in both directions. The author measured 50,000 ohms in one direction and 5 megohms in the other. These resistances correspond to the forward resistance (low value) and back resistance (high value) of a conventional silicon diode. To test the chemical rectifier in a standard diode rectifier circuit, connect it as shown in Fig. 2, again being careful not to disturb the electrodes. Connect T1, the 2500-ohm resistor (R1), and the 20-μf. capacitor (C1) as shown, and plug in the transformer. The author measured 14 volts d.c. across R1; this may vary between 13 and 16 volts, however. The test indicates that the semiconductor film has formed and the rectifier is functioning. You may want to experiment further by using different sizes of aluminum wire, or sheet aluminum. The larger the surface area of the aluminum, the longer it will take to form a semiconducting film, but the larger the d.c. currents the finished rectifier will handle. Fig. 1 - Initially, semiconductor film is formed by connecting the rectifier to a #57 bulb. Use a 16-voltchime transformer for T1, such as Sears Roebuck No. 1407. Fig. 2 - Finished rectifier can be used in the same manner as a silicon diode, as shown here. Connect filter components, read output on d.c. VOM scale. Larger aluminum electrode increases current capacity.